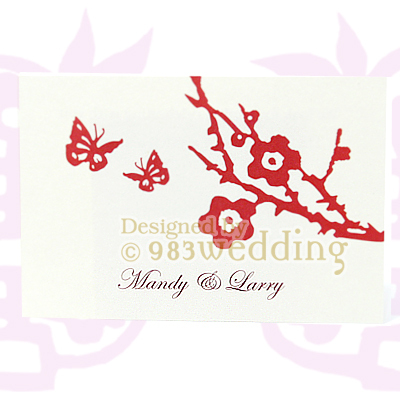 This wedding card is featured with a pair of butterflies. 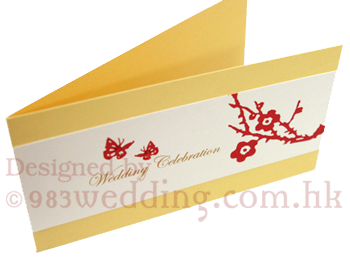 In traditional Chinese culture, a pair of butterflies signifies together forever. This is, in fact, a blessing to the couples. 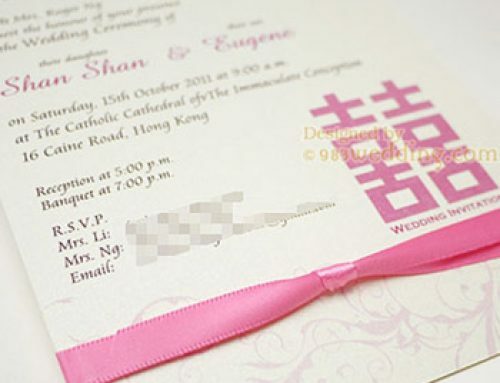 It is also common to see butterflies in weddings of other cultures. In this design, the color of the butterflies is in red. This contrasts with the ivory color of the paper. The contrast can bring out the butterflies and make the image really standout. Butterfiles are not the only element in the design of the cover. Besides the butterflies, there are also cherry blossoms (Mui). 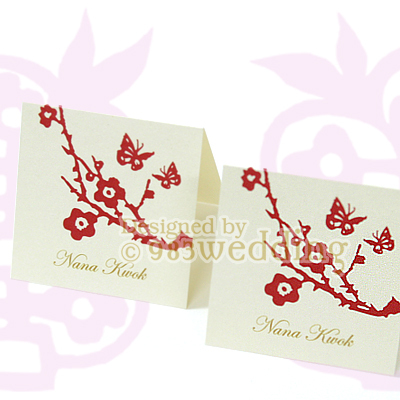 They are also printed in red color in order to bring out a sense of unity of the design. 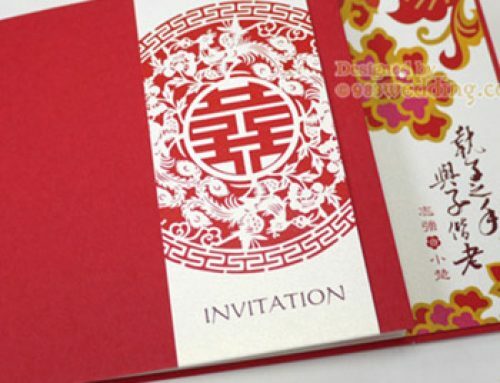 Of course, the use of red color is also because of the contrast with the paper stock. The butterflies are flying around the cherry blossom. The couple is flying happily around the cherry blossom. The couple will live happily forever. The couple will be together for forever. This idea is really unique and romantic. A small piece of rhinestone is put on each of the butterflies so as to make sure that the butterflies will be the focus of the whole design. The bling bling effect of them makes the butterflies even more outstanding. Again, in order to bring out a sense of unity, the rhinestones are also in red in color. Since the rhinestones can render a very strong and elegant bling bling effect, there will not be any problem of using the same color as the print. 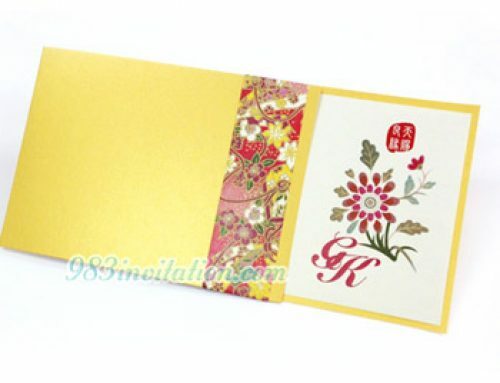 It is a simple but elegance Chinese wedding invitation to give your wedding a unique character. 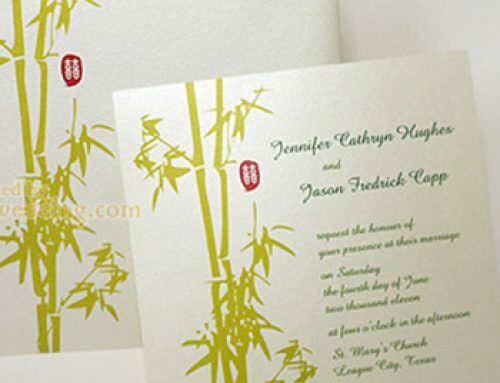 Cover mounted with CW white pearlised paper with full-color printing on one side, with two rhinestones glued on it. 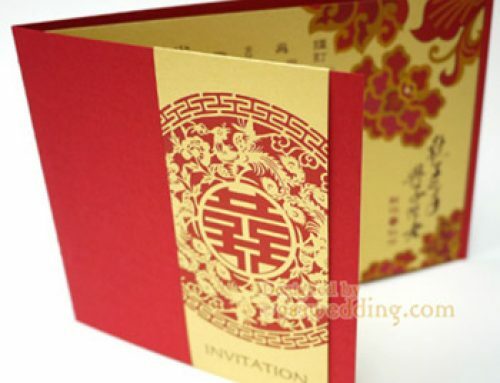 Insert 140gsm Freelife M. Red color paper with gold color hot stamping (foil printing). Insert glued on the card inside. 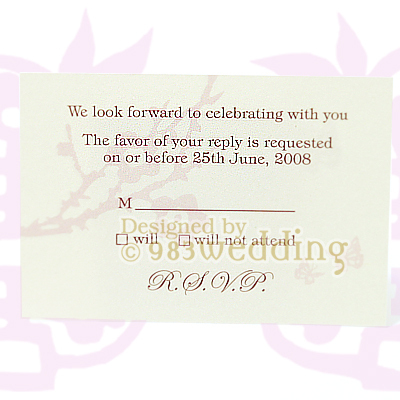 A place card which matches the design of the invitation is also designed, we can even print the names of your guests on it. 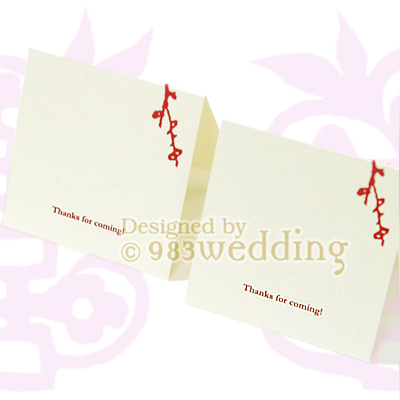 You can personalize the place card by putting the message you would like to say to the guests on the back of the card. There is also a optional RSVP card. 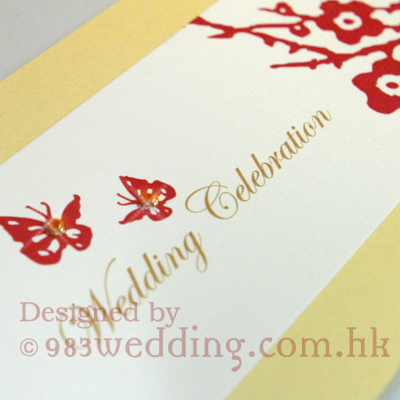 Again, the design of it matches that of the wedding butterflies invitation. Your guests will certainly be amazed when they see this beautiful card.